"Each scene is a snapshot of a story, with a dynamic between the characters working on various levels, which ties into the bigger picture; there's much more to these images than illusion alone." 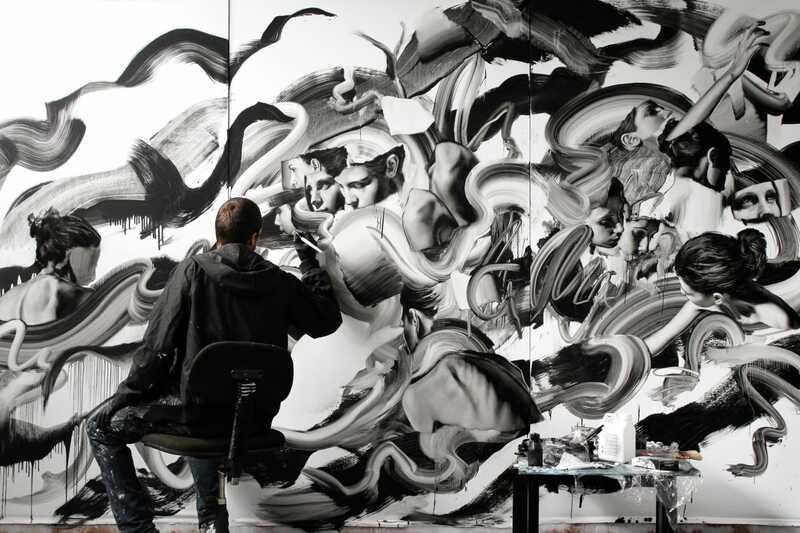 Tom French's powerful monochromatic canvases are driven by his efforts to engage with the subconscious. French’s paintings are a visual discourse on Dualism, a philosophy that posits that the mind and the body are separate entities, with the former residing in a realm beyond the physical. His concerns with the duality of the physical and the metaphysical are reflected in the double images that populate his artwork. Faces, figures, and skulls repeat and shadow one another, the mirroring and the monochromatic palette, and intuitive, gestural brushstrokes tap into the subconscious. French’s artistic and intellectual investigations into the human psyche are an attempt to understand the flux and flow of our emotional reactions and reflections of our subjective self. His research has taken him through the Beat Generation novels and poems of William Burroughs, the Surrealist essays of André Breton, the work of Dada pioneer Max Ernst, and early experiments in psychotherapy. While often depicting the female form, French has avoided portraying women as they are often depicted - purely as objects of desire. His female characters command the viewer’s eye by often taking control of the scene as if they are carrying out action with their strength and vulnerability. His partner, a successful artist in her own right, as well as the birth of their daughter, have reinforced the respect and admiration he has for women in his life, informing the depictions of women in his work. Strong narratives run throughout his work, but as the viewer dives deeper they will recognize that French brings more than just narrative — feeling and emoting, character, power, a sense of freedom, and impulsiveness arise with his use of dynamic brushstrokes. In his pursuit of truth, French chooses a monochromatic palette, the simplicity of which allows for narrative without distraction and for the play of light and dark to expand in unexpectedly haunting ways. French has had critically acclaimed solo exhibitions both in the UK and the US, and his collaborations have included the cover artwork for a release of the soundtrack to cult movie Donnie Darko.